Cookie are some piece of information that are stored in your computer for each Web browser used to access to this Website. At the end of this page, there is a link to delete all the stored cookies. If you have created an account on this Website, you can delete it once connected in header top right menu. Open and review your CAD 3D files, Step included, share them with your prospects and customers and focus on your business. And do it all much faster than ever. 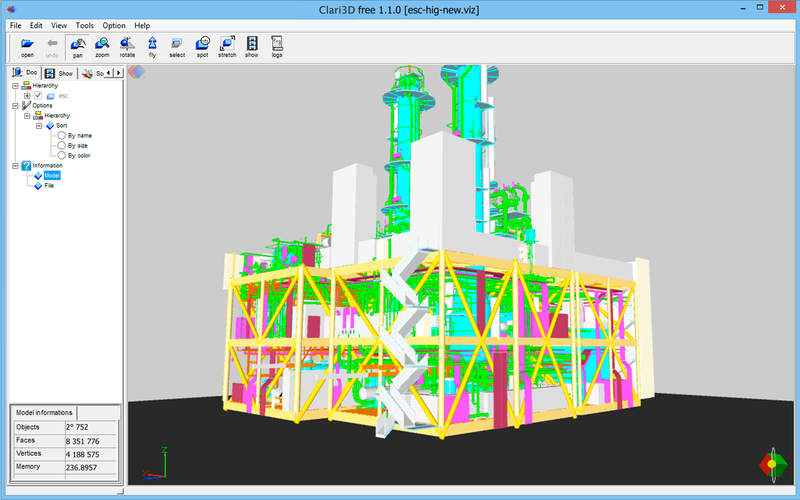 Clari3D opens numerous 3D CAD file formats, for free or with additional modules. Open a 3D CAD file and review it immediately with a simple user interface and take measures, changes the display settings of the model, export it in other formats. 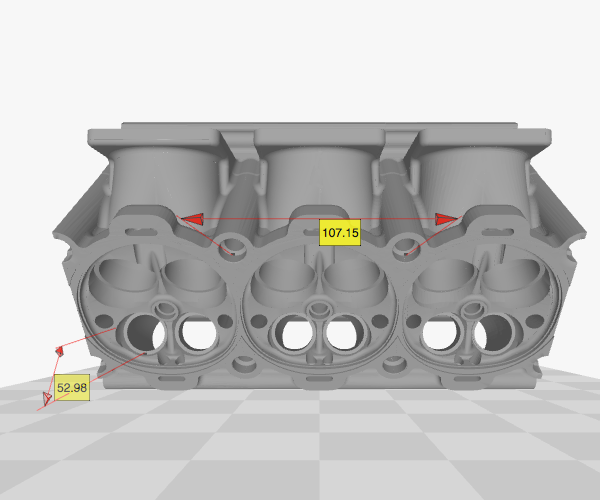 Send the native VIZ file (and so protected) everywhere as it is one of the smallest CAD file format, or send your model by email with our embedded WebGL viewer. Meet your prospects and customers with your 3D easier than ever. The accurate transparency rendering dispays transparent models perfectly. 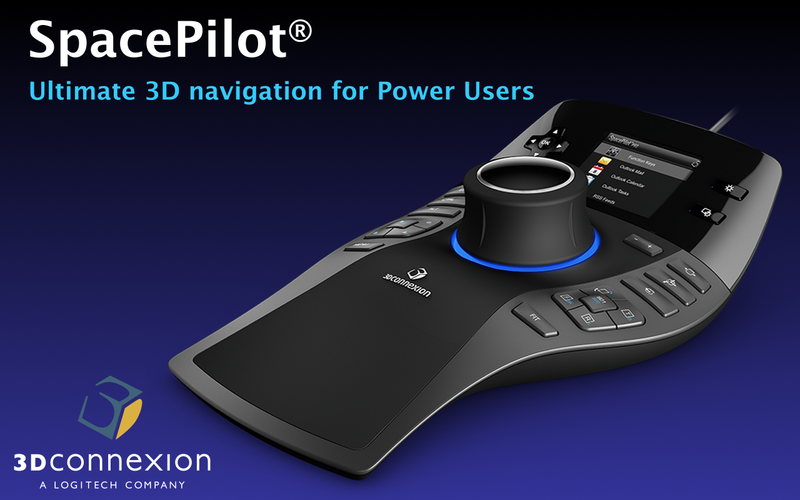 3D SpaceMouse® from 3DConnexion eases the 3D navigation in Clari3d. Anaglyph gadget renders the scene for red-green glasses. Annotations can be put freely or attached to the 3D model, with or without an image. Clari3d is particularly useful with cloud of points. The print tool converts a 3D model in a 2D with Hidden Line Removal (HLR), and SVG, DXF, Postscript exports. 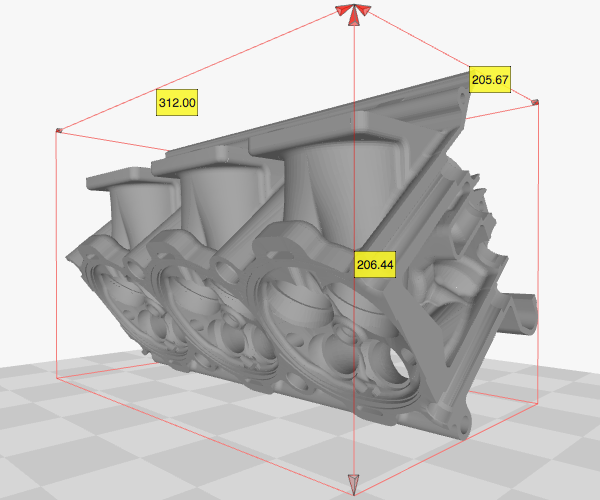 Quote allows putting measures in the 3D model. Clari3d now has full volume shadows (in addition to the bitmap shadows). The Spot tool eases the point of view selection in two clicks. Clari3d is designed to open very wide 3D model. This one has 4 million facets. 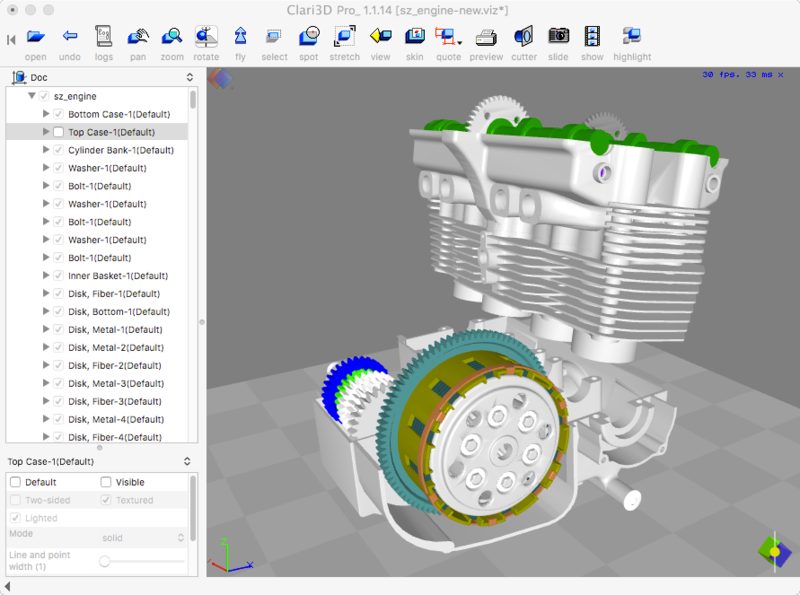 Clari3D is a viewer for 3D files from architecture or mechanical CAD. It also exists in the Lite and Pro versions for Linux, Mac and Windows in order to meet the needs of our customers. It is designed for non-specialist users and its user interface is simple and intuitive. Immediately, you can review your model, annotate it and change the rendering settings. In addition, there is some debugger tools such as Stepalyzer that allows to deeply analyze a Step file. Clari3D software are compatible with 3D Connection Space Mouses® in order to make 3D navigation much easier than before. You can send a VIZ file to your customers; they are able to open it with Clari3D Lite that is not charged. 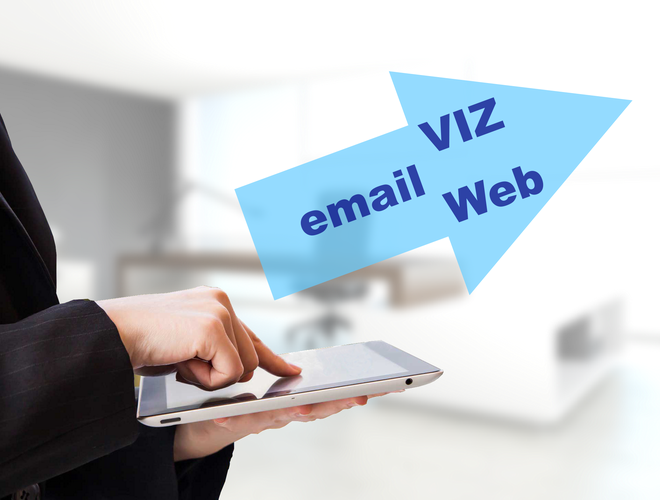 The VIZ file format is one of the most compact in the market. You can exchange in an even more simple way, sending a 3D model directly by email. Clari3D gives you also the possibility to save a 3D CAD model in HTML. This HTML code can be put in your Website, for free, allowing your visitors to view it. In order to have more control, you can also save the model in our J3D format for our Web viewer and design the Web page as you want. And this is free of charge! With its powerful 3D render engine, Software based for Clari3D Lite, OpenGL based for Clari3D and Clari3D Pro, it is able to display huge 3D models in common desktop workstations. In addition, it has real-time rendering optimizations such as Level Of Details (LOD), Rendering Degradation, Details Removal that speed up the rendering during the user interactions. We have designed Clari3D especially for wide 3D models: Level Of Details, Progressive Scene Degradation, Projected Scene Simplifications are algorithms that dramatically decrease rendering time, in real time. Clari3D is very optimized in term of memory footprint; it uses for this purpose a custom 3D data structure and a custom renderer developed for years. In addition, when this is possible, some user interactions are in fact performed in 2D, over the 3D model. This is the case in the quotation tool. Thus, we have been able to display a 20 million polygons model in a 2006 Macbook with a basic Intel® GMA graphic card! 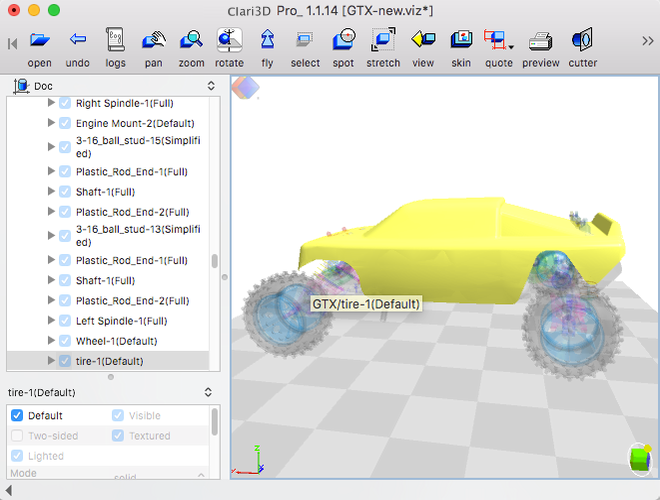 Clari3D works on MacOs from the Lion version to nowadays. 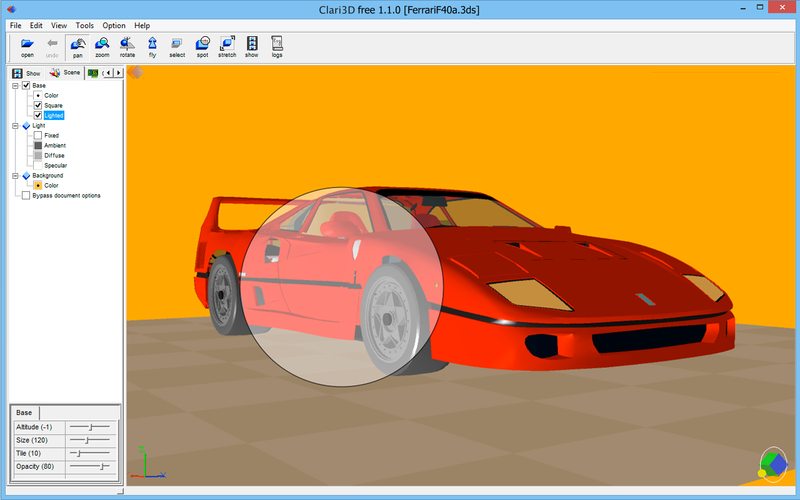 Clari3D works from Microsoft Windows Vista to the current version, in 64 bits. It is a Compatible Windows 10 Desktop Application. 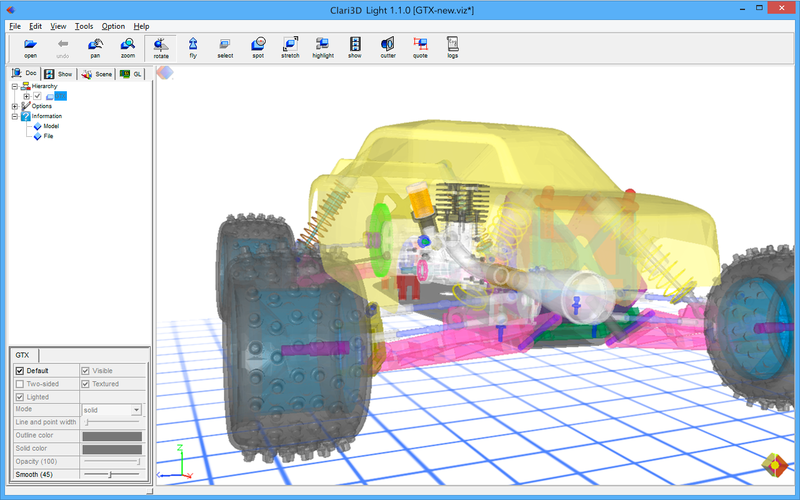 Clari3D is developed with Linux Ubuntu®, its native Linux platform. However, it can be installed in RedHat Linux, Fedora Linux, CentOS and some other distributions as a Snap or and AppImage packages. 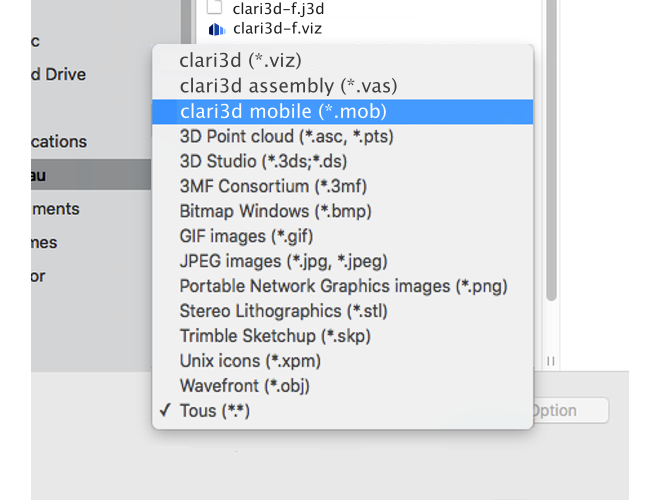 Clari3D works on Linux, Mac and Windows using the native SDK. You can work with all your customers and be confident that they are able to see your files! 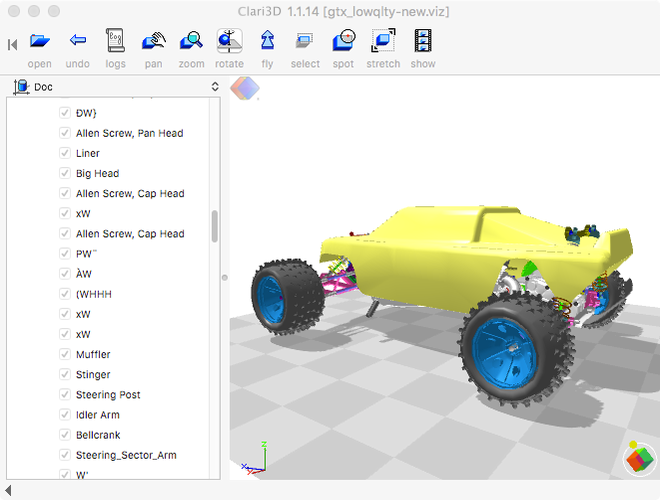 Clari3D is designed with a custom toolkit API that is platform neutral. All the modules speak with this API and so, are platform-neutral. There is of course one module that is deeply platform dependant, the TK module. 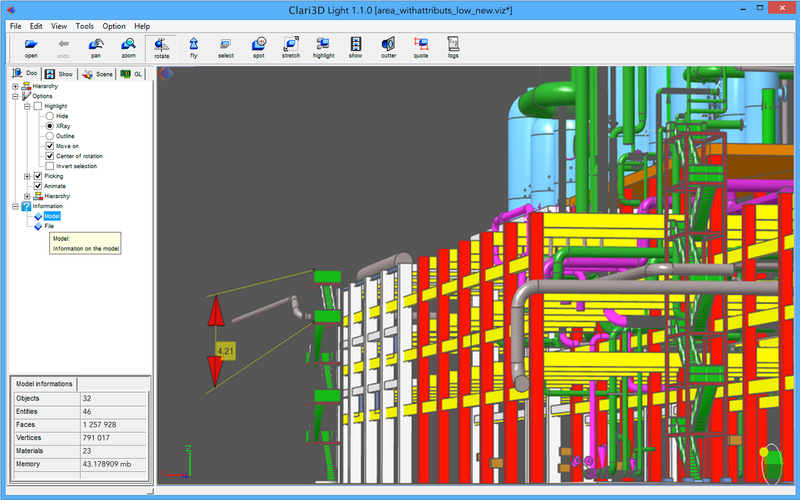 In addition, Clari3D uses a GUI description (such as an XML description) and each module sends its description to the TK module. This facilitates porting and independence. If you have plenty of files to convert, Clari3D is associated to a server tool Clari3D Server that is a command line utility for file servers or Web server. Clari3D Server is a kind of GUI less Clari3D: it is made with the same source code, shares the same libraries and configuration options, but it operates from its command line. 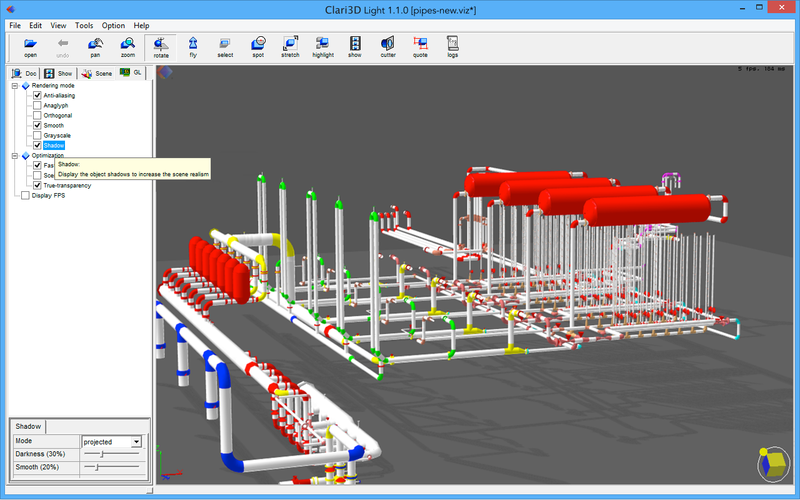 Clari3D Server can be used in Web servers to convert CAD files in VIZ or J3D as soon as they are requested for display. It can also be used in batch mode in order to pre-convert parts of CAD objects that are assembled with the VAS (VIZ Assembly) file format on request. 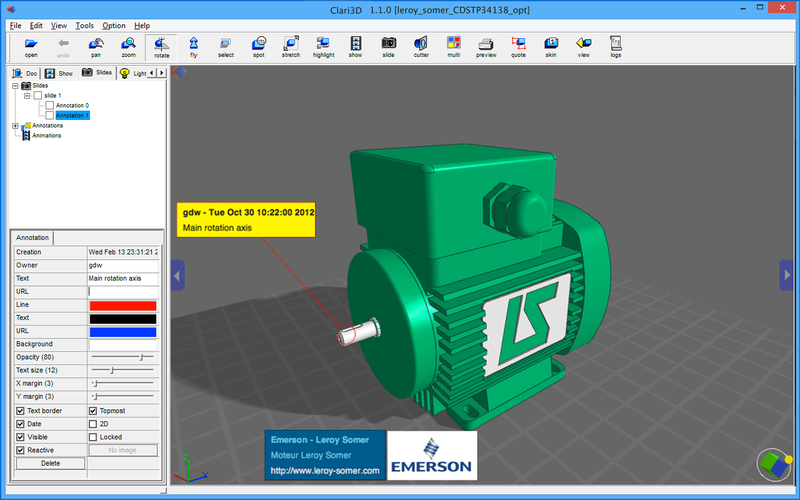 Emerson-Leroy Somer online configurator works with Clari3D Server both in batch mode and in real time. The tree-view shows the complete hierarchy of the model. The hilighting mode shows the object selected in the tree-view. The other objects are displayed in xrays or with outlines. 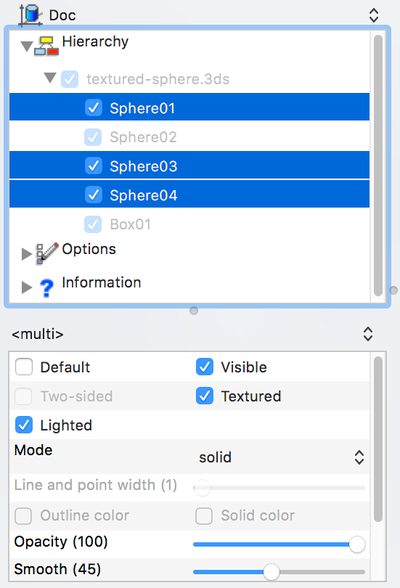 Object can be simply show or hidden with their check box in the tree view. Clari3D has advanced tools to help you to explore your 3D models. 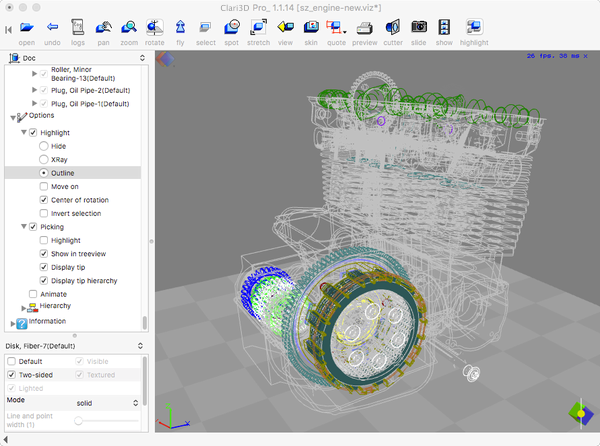 The tree-view shows the structure of the 3D files with the parts. Parts can be shown or hidden with their check-boxes. The standard and Pro versions allow to edit the rendering attributes (color, transparency, rendering mode, ...). The hilighting mode in the Pro version makes the relation between the displayed objects and the part list by clicking either on the 3D objects or on the part names in the tree-view. The hilighted part is displayed normally while the other parts are either hidden, displayed transparently or with their outlines. The picking mode allows to identify an object in the 3D scene and to select its tree-view entry when clicked. Open just the 'File/send by email' menu and you are ready! Configure your email, press 'Send' at that's all! In addition, the access to the files can be protected by a password. 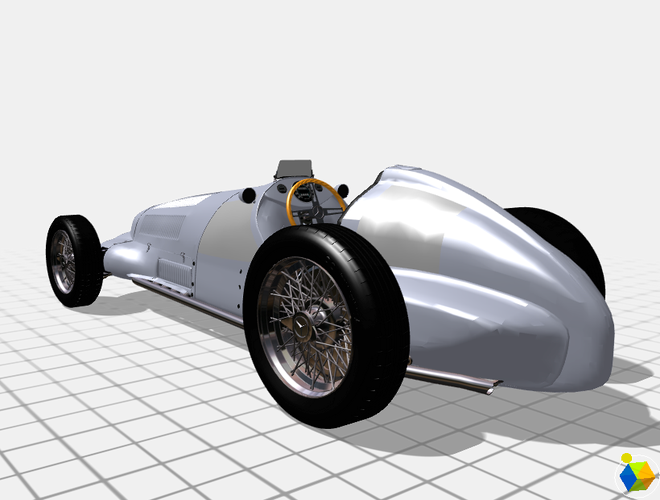 And this is included in Clari3D Lite, for free! Click to select the rotation center and drag the border of selection area. Double click and the point of view is changed as you want! A difficult action in 3D is to "go somewhere" in the model. 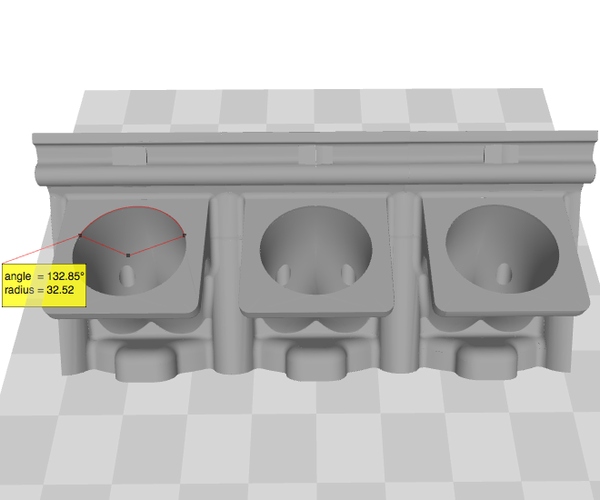 Clari3D offers several great tools for that, and the simpler is the Spot tool. double click to validate the viewing area and the point of view is now as you expected. Quote your model in one click! Distances are taken between two snapped vertices. The bounding box of the whole scene or of some objects. The arc between three spnapped vertices. 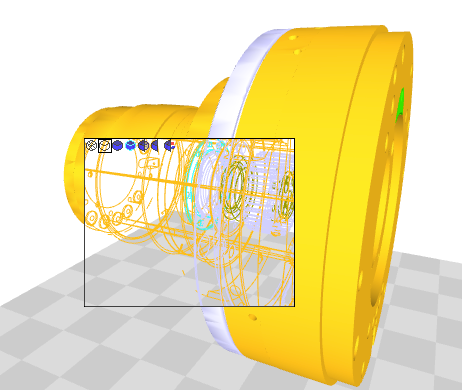 The Quote tool in Clari3D takes measures on a 3D model. bounding box of the whole model or of selected objects. Quotes are put inside the 3D model. Hierarchical options can be applied to any objects, such as color or rendering mode. The materials associated to an object are also editable. Clari3D allows to set per objects the rendering options such as wire-frame or solid mode, color, opacity, etc. In addition, the light can be customized as you want in order to obtain a semi-realistic view. Shadows and Fog can be used to improve look. Uncutted model, with probably a lot of things inside. The cut plane shows inside the model. The cut plan can be freely rotated and translated. The cut plane is an interactive 3D object that allows to cut the current model. It has handles on its corners that can be either clicked or dragged. On click, the cut plane is rotated by 90°. On drag, the cut plan is freely rotated, following the movements of the mouse. In the middle of the cut plan, a handle translates the model on its axis, moving the plan. The first immediate way to change the light position is to drag the little sun in the logo, at the bottom-right corner of the view. If the mouse is over the logo, the arrow keys can be used to change the light position as well. 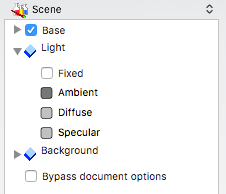 In the Scene module, the light colors can be set individually, such as the ambient color, the diffuse color, etc. If the light is 'fixed', it is attached in the scene. It is attached to the camera otherwise, meaning that it follows the point-of-view. In the Pro version, the Light module can manage up to 8 lights. Each light can be a sun (infinite light) or a spot. Spots can be put anywhere in the scene, providing nice effects. Export a 3D model in vectorial 2D formats. Generate a true 2D vectorial document with optional hidden lines for documentation. Sometime, it is needed to put a 3D model in a documentation. Usually, a screen copy of the rendered outlined model is inserted. However, it should be nicer to insert a vectorial image rather than a bitmap in order to be resolution independent. Clari3D Pro transforms any 3D model into a full 2D vectorial image with hidden lines written as dashed lines. Explore the interior in outline mode. Explore the interior with the cutplan. Explore the interior with the inteligent cutplan. The skin tool is a window that displays the hidden parts of a model. 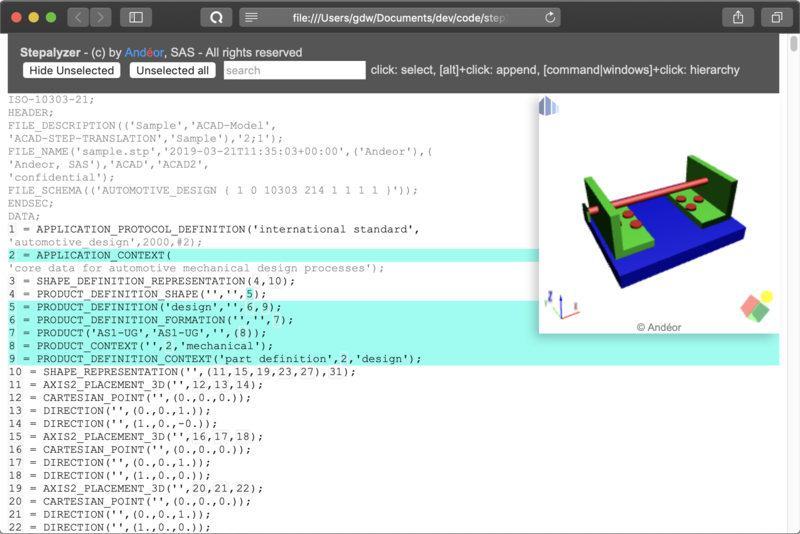 Obtain an interactive analysis Web page with embedded 3D viewer from any Step file. The debug tool Stepalyzer generates Web pages from a Step files that allow to interactively analyse the file structure and trace the Step entities. In addition, a 3D embedded 3D viewer is included. Preview 3D is a standalone application and a software component integrated in the Operating System allowing to obtain thumbnail previews from the 3D files. 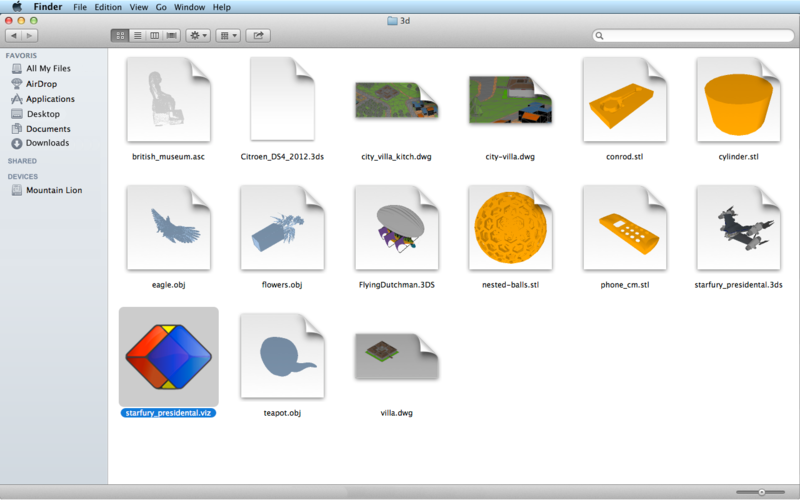 Preview 3D replaces the 3D file icons by a preview of their contents. The previews are displayed in place of the file icon in the file manager, Finder® on Mac, Explorer® on Windows®. 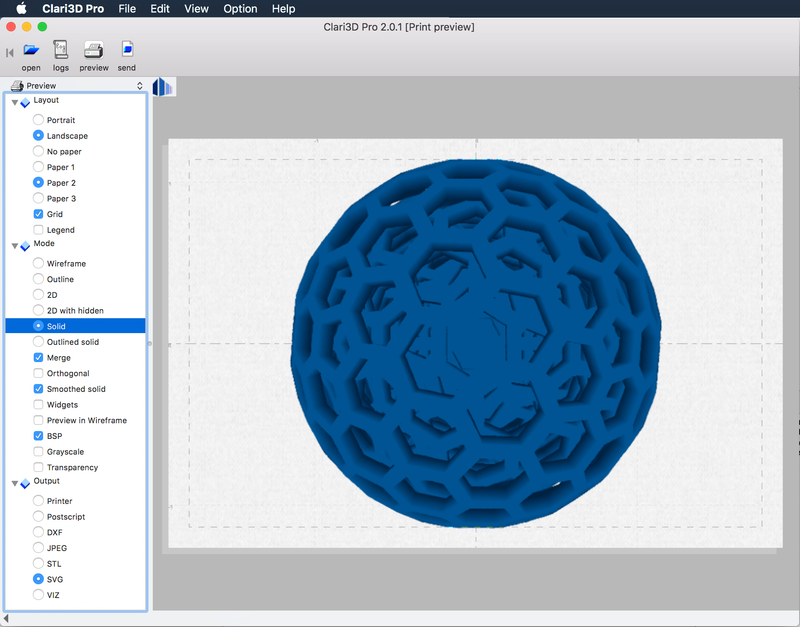 Some other applications can take advantage of Clari3D previewing, such as Mail in Mac. Preview 3D is able to extract a preview image from the files that does not have one, such as STL files that are in pure ASCII. For this purpose, Preview 3D has its own 3D renderer. With rendered files, hi-resolution images can be generated in the clipboard with transparent background; that is useful for integration in other documents. It can be use in mechanic, architecture, engineering or communication. 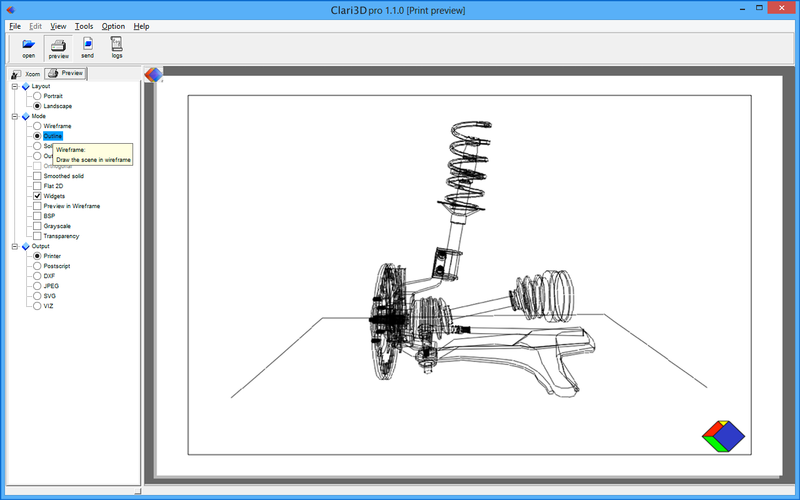 In the table, embedded means that the file format has a previewing image inside and computed means that Clari3D Preview is able to compute the preview by itself. For some file formats such as 3MF Consortium, if the file does not have a preview inside, Clari3D will compute it. 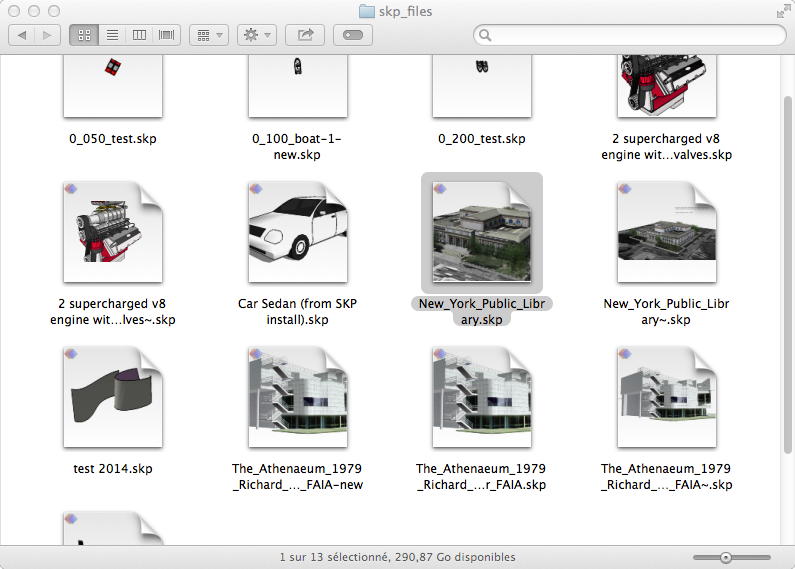 Several files can be previewed at the same time by drag & drop in the standalone application. In addition, textures are opened. This is not a 3D viewer: do not expect to interactively review a 3D file with it. For the files with preview images inside, this image is used as is with the accuracy it has. For the files that can be rendered, MacOSX and Windows both forbid the previewing components to open other files; therefore, the textures associated to the 3D files cannot be opened. In addition, the software component limits itself its computation time and its memory use; this way, a rendering can be interrupted before the preview image extraction in order to preserve the system resources. 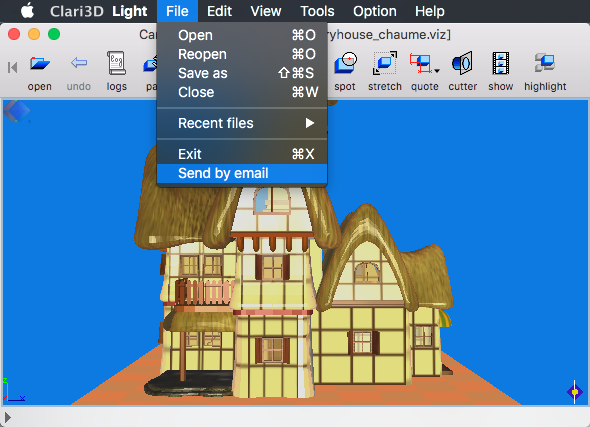 In Clari3D for Desktops, you can get a Web page with your 3D model embedded inside with the menu 'File/Save as' and choose the HTML output format. 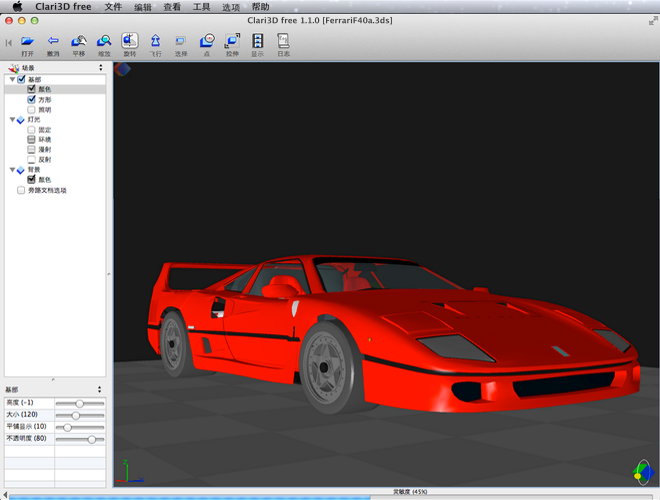 In the same way, it is possible to obtain directly the J3D file that is the file read by our Web viewer. With it, you can put any CAD model in the Web in a couple of seconds. It is highly configurable (background or not, user interface or not, etc), so you can adapt the look and feel to your requirements. Clari3D Server is able to convert numerous CAD files into HTML or J3D, in batch mode or in real time. In addition, Clari3D Server can sign the generated files, and this signature is displayed in the viewer. It is the preferred way to industrialize the J3D generation. Three converter licenses are available, for 1000, 5000 or an unlimited number of conversions per month. The third model is a 3D scan result with texture. Your browser seems to does not have WebGL (either because WebGL is disabled or because it is missing). 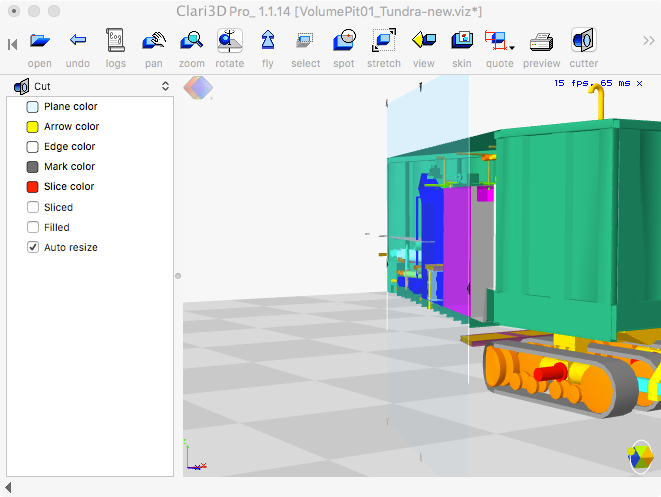 This the lite edition of Clari3D that offers all the tools for quick review of your 3D CAD files. 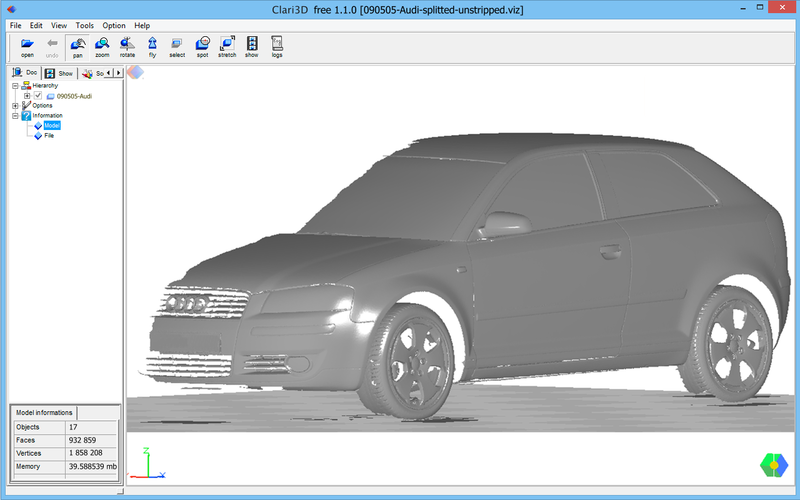 Clari3D Lite allows an easy review and handeling of 3D models. Objects can be shown or hidden from the tree-view. It uses a software 3D renderer with high resolution. It opens Step and IGES without attribute, WaveFront OBJ, STL, 3MF, ASCII Cloud of Points ASC and PTS, XGL and 3DStudio 3DS. 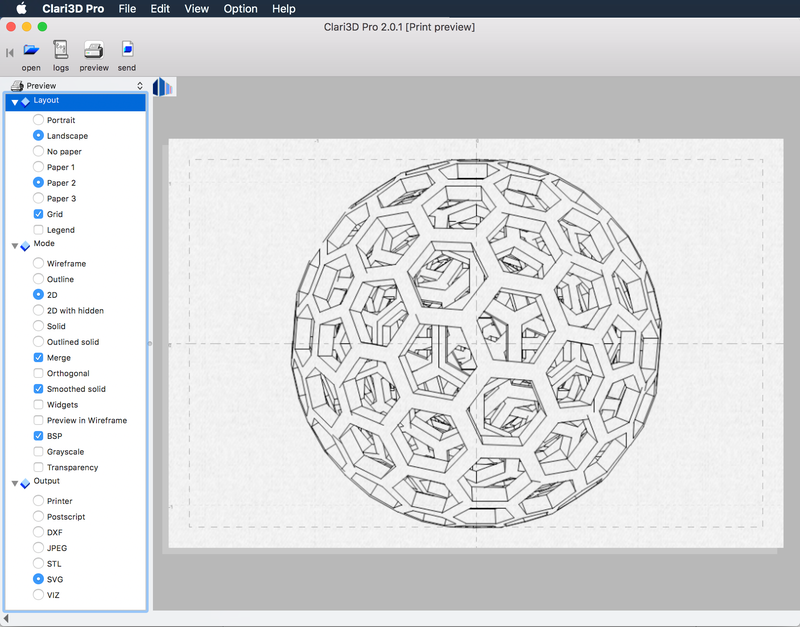 Clari3D is the perfect companion of a 3D designers and reviewers. 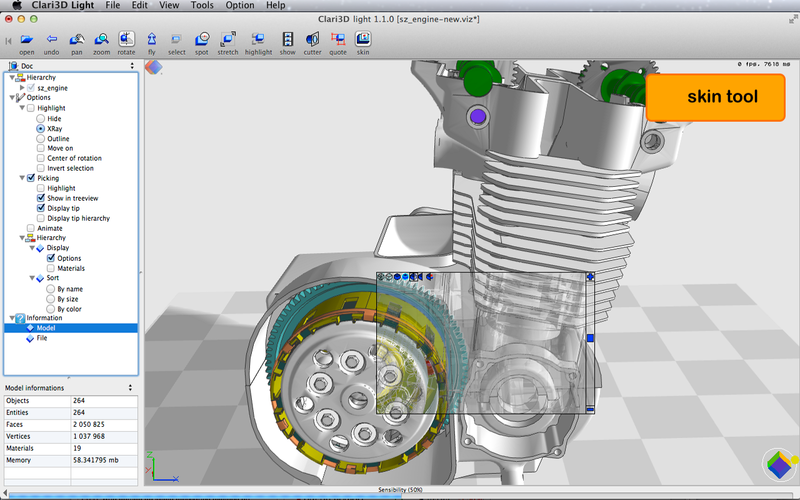 Clari3D allows easy review and file manipulation. Objects can be shown or hidden and their display settings can be adjusted. 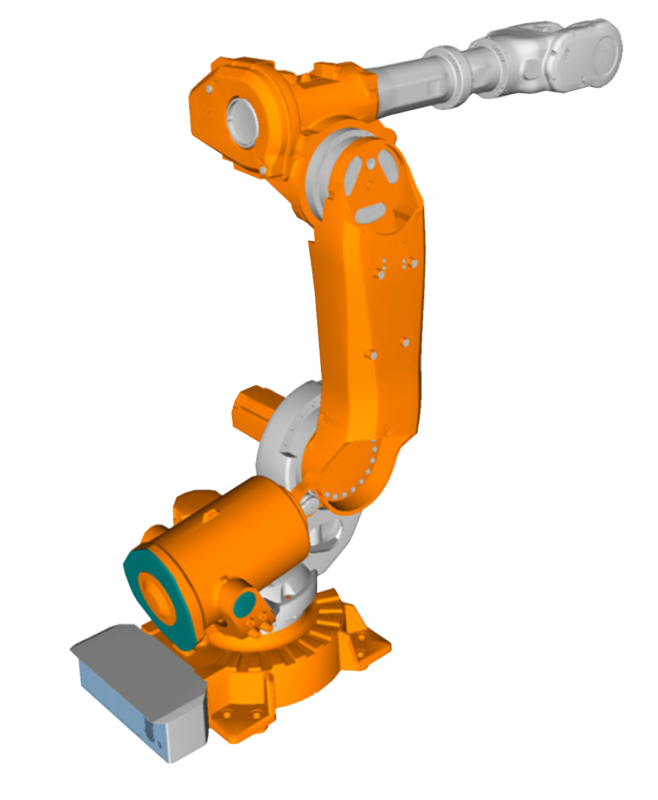 It uses a hardware accelerated 3D rendering engineand includes CAD tools such as the cut-plan. It can open Step, IGES, WaveFront OBJ, STL, 3MF, ASCII Point Cloud ASC and PTS, XGL files and 3DStudio 3DS files. 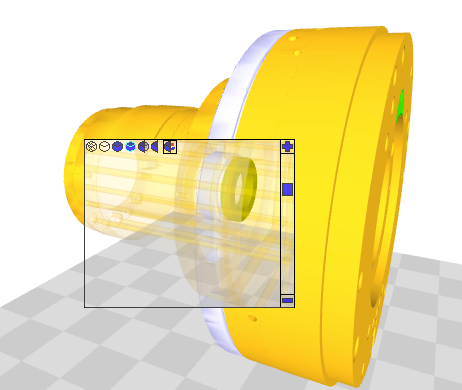 Clari3D Pro is our 'all-included' 3D viewer! It includes all the modules and functionalities described here. 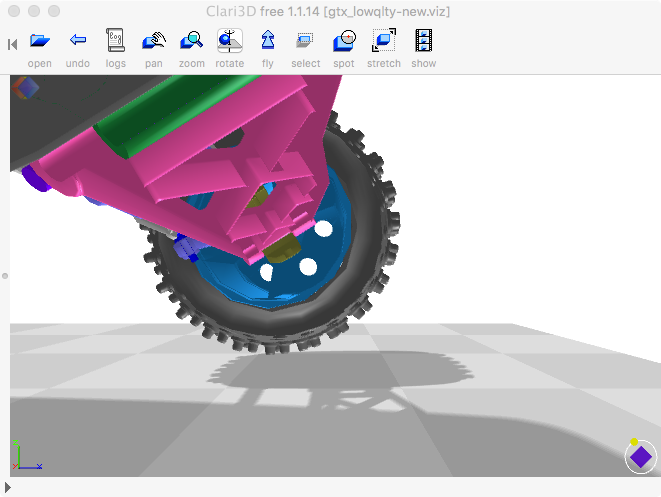 Clari3D is a versatile 3D viewer that can be extended with third party software components such as the 3D CAD files readers. It use the last generation of 3D hardware accelerated rendering engine and it allows to fully review and change 3D files and rendering aspects. The Pro version can open WaveFront OBJ, STL, 3MF, Ascii Point Cloud ASC and PTS, XGL files, 3DStudio 3DS files, Step and IGES files for free. Supports all ACIS versions until 21 for the .asat and .sat files. Cadds 3D explicit and parametric files. 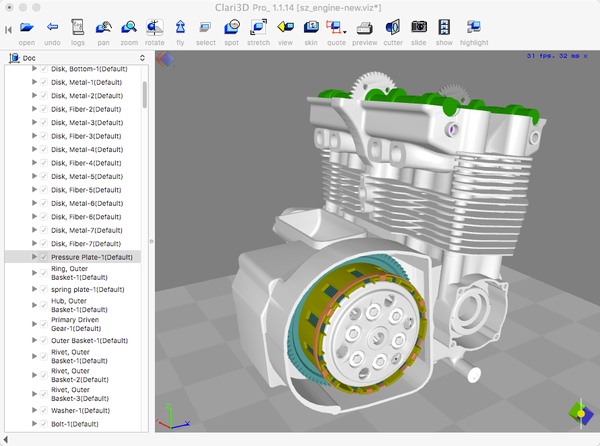 Catia V4 reader from 4.15 to 4.24. 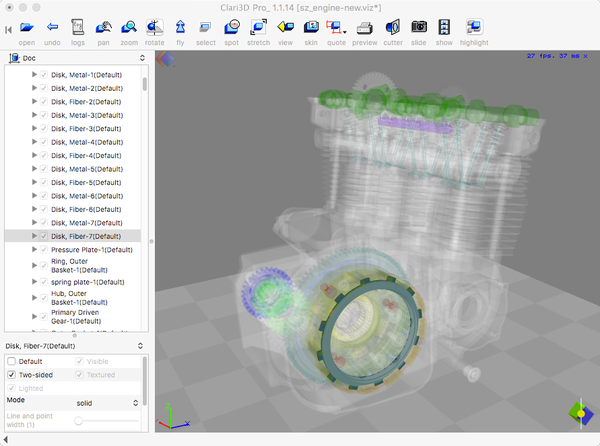 Catia V5 reader from CatiaV5 R7 (See Mapping for advanced features) to R23 (also called V5-6R2013). extensions: .CATPart, .CATShape, .CATProduct, CATDrawing. Catia V6 reader from R2010x to R2013. 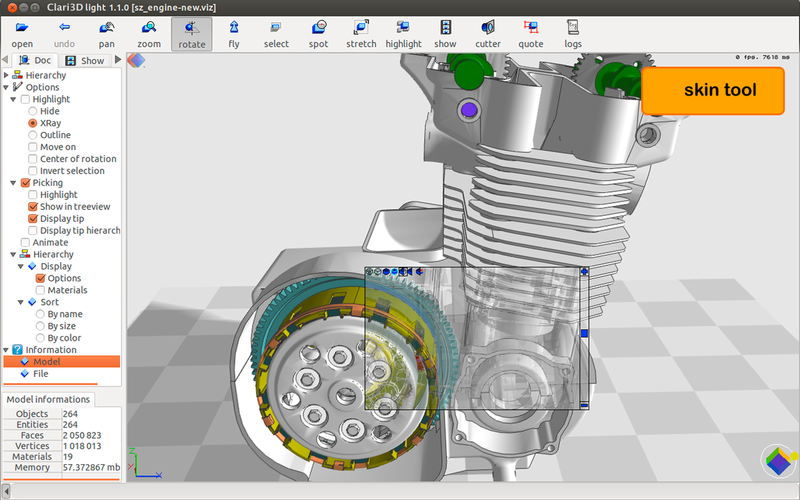 Include Catia reader version V4, V5 and V6. Cadds (Windows), Catia, Cercon, Cerec (Linux, Windows), CGR, DCM (Linux, Windows), Inventor, JT, Parasolid, ProCera, ProE, Solidedge, Solidworks, Unigraphics, VDA. Clari3D Server is the conversion tool designed for the servers such as Web servers. It operates in real time or in batch mode. 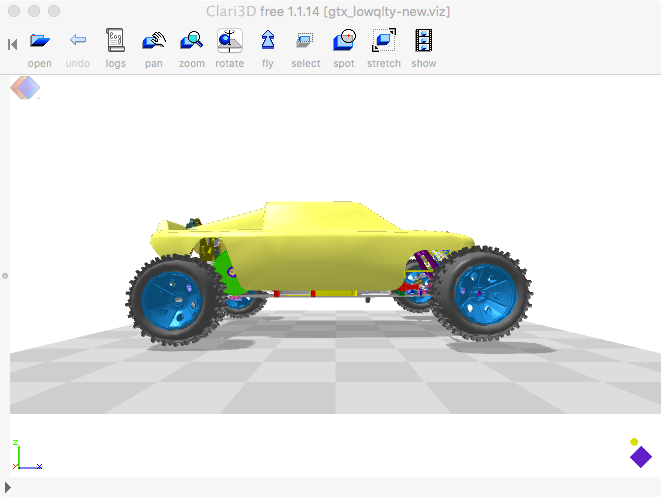 Clari3D Server is a server side converter that converts 3D CAD files into our native VIZ file format or in WaveFront OBJ, STL, J3D for our Web 3D viewer clari3d.js or HTML with embedded 3D data. Clari3D Server can also assemble several heterogeneous files into a single VIZ using its VIZ Assembly file format. Export a 3D file in flat vertorized DXF with form reconstruction (circles, arcs, lines). License server 10 simultaneous uses of all the products for one year. 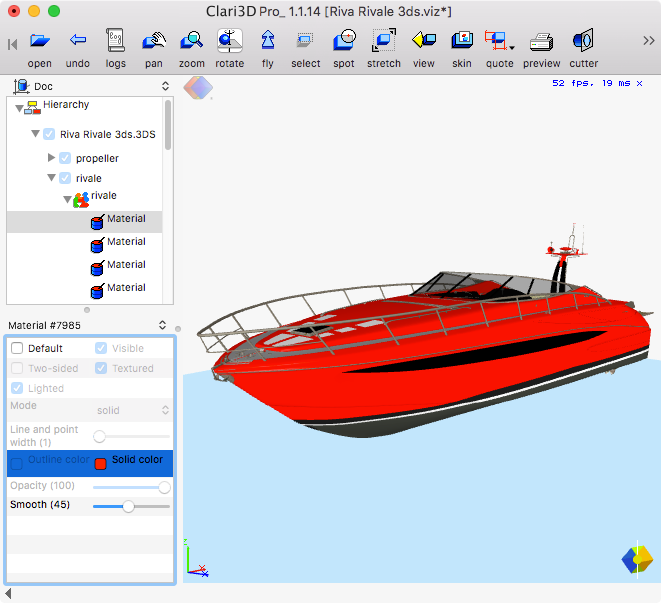 This tools allows to use 10 Clari3D products simultaneously in the same network, including all the CAD viewers and readers. This a one year subscription. Web exporter level 1, up to 1000 conversions per month. Generates up to 1000 J3D or HTML files for clari3d.js with your own signature. Web exporter level 2, up to 5000 conversions per month. Generates up to 5000 J3D or HTML files for clari3d.js with your own signature. Web exporter level 3, unlimited number of conversions per month. Generates an unlimited number J3D or HTML files for clari3d.js with your own signature. Preview 3D replaces the icon of the supported 3D files by a preview of their contents in your file explorer. Preview 3D either gets the preview image stored in the file (such as DWG CAD files) or renders the 3D scene with a custom 3D renderer. It is a software component that is integrated in your system during the installation. This way, you can see a preview of the CAD files in your explorer, Explorer in Windows or Finder in MacOS. Preview 3D recognizes 3D Studio, STL, XGL, WaveFront, ASCII points clouds, Step / IGES, AutoCad® DWG™, Trimble Sketchup®, Dassault System 3DXml®, CATPart® or CATProduct®, 3MF Consortium, XGL. In addition, there is the standalone application that allows previewing of several files by drag & drop. Notice that this is not a 3D viewer; it is not interactive and for some file formats (ie DWG) it uses the preview image stored in the file, with the quality it has. Units of service allowing us to meet specific needs. This product allows to pay for units of service, as custom developments, deployement helps, customizations, etc. 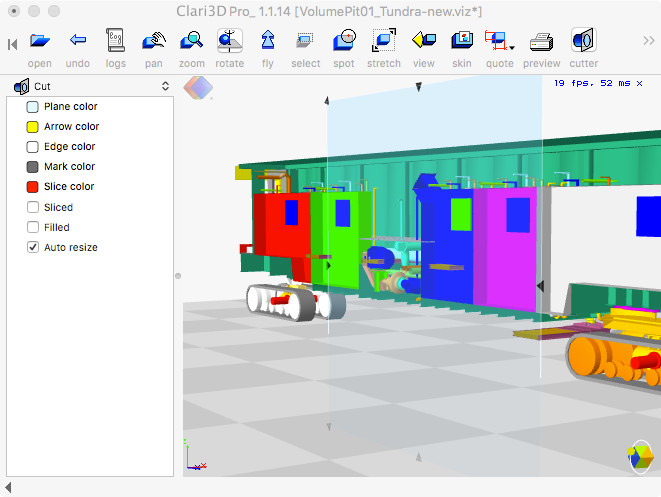 Clari3D software are supported by Andéor, SAS on the following editions of Windows 10 – Windows 10 Pro, Windows 10 Education, and Windows 10 Enterprise. Clari3Dsoftware are supported on the in-market supported Windows 10 Current Branch for Business (CBB) servicing branches only and will be supported for the lifetime of the app until 01/2027. Clari3D software can be obtained from either the Apple Store or from this store. Software gotten from the Apple Store have the benefit to be validated by the Apple engineers. In addition, one license can be installed to up to three systems, for the same user; for example, a desktop computer and a laptop. The software are executed in a secured layer called Sandbox. In the sandbox, software have limited access to the data in the computer. This is why, for example, Clari3D is unable to open textures associated to a 3D file. We have aligned the number of installations per license to three, as in the Apple Store. The price is significantly lower than in the Apple Store. In addition, we provide a money back guarantee during seven days following a purchase on simple request. You can get our software for several operating systems; be sure that you have selected your operating system in the top menu and the download links will be updated automatically. When you purchase a software, you can install it in three systems for the same user, whatever is the operating system. If you can, please prefer regular Clari3D rather that the Lite version or buy Clari3D Preview. This gives us the opportunity to plan further developments and improvements on our software. Generally, sofwares in the market are updated every year. Customers can obtain the new version with an important rebate, generally 30%. We plan to merge Clari3D Lite and Pro in the regular product with InApp purchases; Clari3D Light and Clari3D Pro owners will be updated for free with the equivalent features. Free 3D imports are available in all the Clari3D line for free. It is regularly extended as soon as we write a new library. 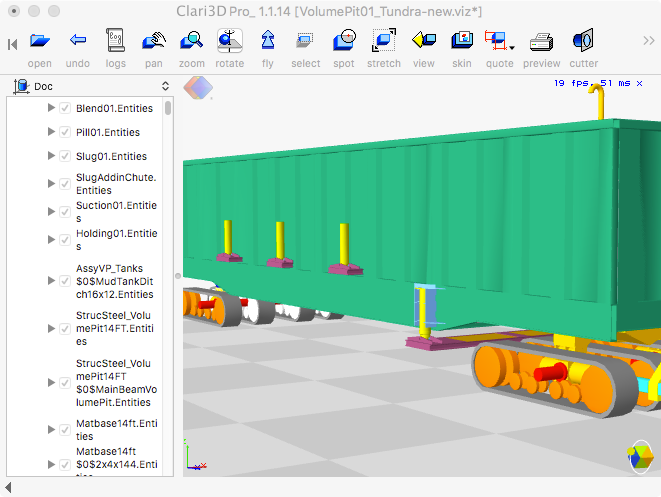 Pro CAD imports are optional modules for Clari3D Pro and Clari3D Server with a price. They are not free because they are third party components that are subject to royalties. Modeling 3D: allows creating and editing 3D models. Clari3D will be able to triangulate soon! We are finishing a promised point cloud to triangles algorithm that will allow to open a point cloud file and to transform it transparently in a full 3D textured model. We would like now to include a ray-tracer, GPU optimized, with the capability to generate photo-realistic images and video of animations (this feature was not in our initial plans). 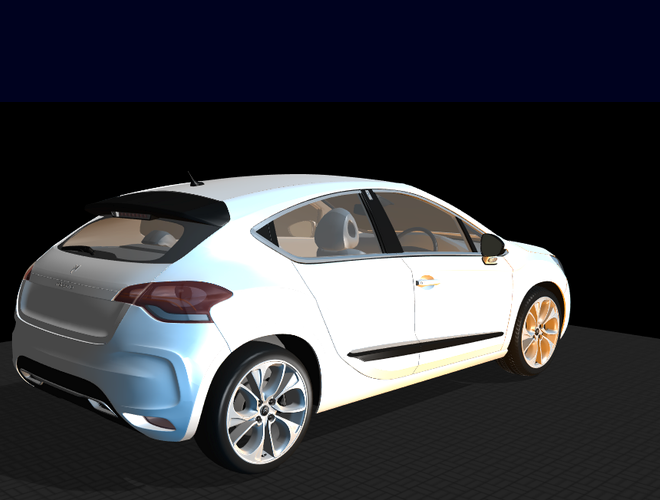 This ray-tracer will focus on light mapping, allowing to analysis the light received in some parts of the model with accurate light descriptions. We have started the last step, the more ambitious one: create a 3D modeler. As Clari3D is designed to be a viewer, its internal data structures are very optimized; transforming them for modeling is a great challenge but we believe to obtain a very efficient modeler with low memory needs. You will see in the next releases some functionalities coming from the modeler; probably, the first one will be the ability to move, rotate and scale any 3D objects... The next one will be probably the animation tool able to step the transformations on the objects in order to create complex animations. 2csm3d Créative3d Printing3dconnexion3distributed3dwp4cad.InfoA.J.EAapelAaryespeAcebActyx AgAdipomAircraft Rubber Mfg Inc. Dba Fuel Safe SystemsAkins Heat And AirAlstomAltania EngenhariaAlternative ManufacturingAmgAmphenolAncientfutureAnimaAppleArc Design InstituteArchimede EnergiaArendadirectArt ToonAsasAsdAspen Sky Window CleaningAssistebAsytecAudubon Dental GroupAutecAutonomyAxiome SlrBarthaBausch Switzerland SaBbdoBenchmark ElectronicsBernhardt Apparatebnau Gmbh U. CoBeweisBibleway BelieversBlcBlitz Plumbing Pty LtdBms BvbaBoring Service Llc.Boschert Precision Machinery, Inc.BrandoolsBremboBros CommunicationBrown'S Electrical SupplyBud Johnson & Associates, Inc.Bwp MediaCabCafetanolCalclosetsCarrying LaptopsCastle Brook CorpCde AsiaCdplCea SaclayCehCentral Carolina ProductsCentral MarketCgjoyerosChargestorm AbChatelain-InfoChong Woo America Ltd., Inc.ChuangyuanCinelookCitadel PlasticsCivilClearbrandCmiCnbaCnc-Step E.K.College GuebwillerContinental AutomotiveContour Forming, Inc.CopaveCopie ExpressCrash Safey, Inc.Creative Design & ManufacturingCsat- SolutionsCxrx SarlDahdaleh Medical CenterDamcortechDaymos CoDeerpark CreationsDelta EquipementDental LaboratoryDfl InfotechDfsDingdong CustomsDisplaylinkDprdEdgard Moura NegociosEdiEdisontvEgypt Over SeasEhlers & Hecker Partnerschaft IngenieureElaut NvElheEliteElite Antennas LtdEmersonEmerson Industrial Automation BelgiumEmt PenzbergEnvision Industries, Inc.EquibrasEsaEssEts RobineauEuratom-Enea On FusionEvent52FinekFinfrockFinger Food StudiosFlamespray North AmericaFlexitech IncFonfonFrancofilsFrenckenFslFuturaautomation Pvt LtdGa Sales AssociatesGafachi LabsGascogne TechnologieGdwhhGenalyteGermaplastGhvewjkhvfGjdtechnics BvGlobal CGold Leaf Development LlcGold SealGpiGpm Tools S.R.OGraebener-Reika IncGrown-UpGsdiGsgGyg Me9xicoHagerman & Company, Inc.Hayward GroupHexion CctHydecontrolHyper TechnologiesI-Electronics Co. Ltd.IbaIdenova BvIkcoImmersive LabImrohithIndigenous Traditional IndustriesIngenieria ReadInspiration Design SpaceInstituto Santa ClaraIntegra Di Jorma SturariIntegral BiosensorsInter ConseilsInveni GroupIooota SrlIt4allItma&C LtdIut De CachanIzhtorgmetalJaime Casino AlgarenJdstJinlongJkmmJohnson ControlsKasper FabricationKd A&TKeep Calm Barricade CrewKenneth I Light MdKingspanLaerdalLafert Electric Motors LtdLagers ApparatserviceLancewerkz LlcLandmarkLe MoniteurLeroy-SomerLevelupLgt Paul CornuLi.Plus GmbhLighten UpLigne BoisLinLinkLmdaLt MachiningMaatelMagtarget LlcMahacoManMartinezMastercardMctechMd Rallye SportMeg1MelagMetuMila Milaw CoMiltary Technology Advancement GroupMipa SasMitutoyoMkd Usa LlcMohan'S HvacMorphing HorizonMrcbMsn TechMuhimaMultigrainNano ArquiteturaNational Deaf Children'S SocietyNautical StructuresNessunaNextpageOatsOcean AeroOlivettiOmz ItOptesOrdinacijaOsgoPalote CompanyPaul WurthPeter Madsen Rederi A\/SPeter Sauer & Sohn KgPike ElectricPlustechPmisiPolitehnica University TimisoaraPonte Nova EnergiaPositronicPrecitechProduct Development IncProgecad SrlPromau Engineering SrlPscPublicisQualilife GreenQwRatcRate Construccion Y Automatizacion S.A. De C.V.Raul Morales & AssociatesRedd'S Barbershop LlcReinpsaRepublic WirelessRicohRipcse Zsolt E.RnkRockmart Middle SchoolRoma3 UniversityRpgS. Kershaw & SonsSamsungSan Valentino TorioScape TechnologiesScripps CollegeSeco Group A.S.Ses-SterlingShibe DesignsShowtex Nederland BvSiaSimone BianchiSirioSitemSketchcandy, IncSlac National Accelerator LaboratorySo Cal Design BuildSoftlineSpot TechnologiesSricityStasaStork ImmStsSumitomo Precision ProductsSupraT-MobileTantonTatic DesignstudioTechnientTechnocanTechnoserv HollandTeslarTevaThe Black Company EnvironmentalThe Brody School Of MedicineThe Robots Are Coming Pty LtdThisdiamondsrare Inc.TraTrevino'S Welding & MillwrightTriasTridennTrinetics Group IncTsmcTweddleUacj TradingUbio LabsUfpbUiray TechnologyUnadUniversidad Nacional Pedro Henriquez Ure\U00f1aUniversity Of ZagrebUnizarUsamiles Int'LUscUtnV-Plane EngineeringVeryplus Co.,Ltd.VfhsVisio-GreenVitaleVksbsdnVoltVoss Aviation&Motion Tech. Ltd.Wajer Jachtbouw BvWilliam Paterson UniversityWolterXeteraXxdxZ&S Sales And Marketing B.V.Zana, Inc.
and +50000 anonymous customers in the world from the Stores we want to thank a lot for their patience and their support! Not much to complain about for a free application. The viewer is very fluid and does the job. Clari3D has now two killing functions, the ability to put my models online for free and the tool that convert them in SVG 2D. I have downloaded the update and it works perfectly ! When i have time I will post on the forums to inform everyone. Thanks a lot again !! All the best to the team ! The Web plugin of Clari3D is remarkably stable for a so young software. It is nice to use, fast, and the integration in the Website of our customer is easy. Andéor is founded in France in 2010 after seven years in R&D. The Andéor mission is to democratize the use of 3D by allowing everybody to access to any 3D contents everywhere, with any devices. The Clari3D solutions are in the Apple Store®, the Linux Ubuntu Store®, the Windows Store® and Clari3D Store since 2012 with a frank success. Sonora B - 71, avenue de la Lanterne - 06200. Nice, France. Andéor® and Clari3D® are trademarks on the property of Andéor, SAS. Twitter is used for daily support and informations. Facebook is used for daily support and informations. RSS is used for daily support and informations. Youtube is used for daily support and informations. The Clari3D manual can be viewed online with this link . You can ask us a question or leave us a message in our online form support by opening the detail below. Apple, MacBook, the Apple logo, iPad, and iPhone are trademarks of Apple Inc., Windows is a trademark of Microsoft Inc. Ubuntu is a trademark of Canonical, SpaceMouse is a trademark of 3DConnexion, registered in the U.S. and other countries. This website is generated with our Website compiler HTGen. We are please to announce the new version of Clari3D suite and its new Website. Starting to the version 2.0.3, Clari3D Lit now opens Step and IGES files natively. This will dramatically increase the compatibility with the industry standard and the user needs. 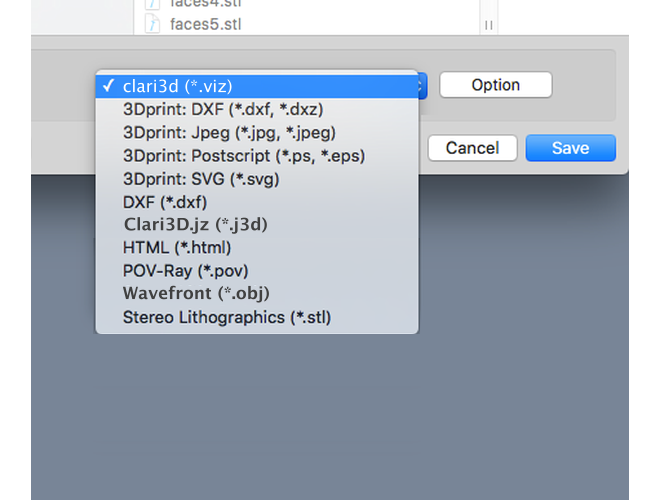 Clari3D Free is renamed as Clari3D Lit and Clari3D Light is renamed as Clari3D. These renaming have no impact on the existing license that will be transparently updated. The next version of Clari3D will allow multi-item selection in the treeview as well as multi-object selection in the 3D scene. The rendering options of the selected objects may be modified globally instead of changing them one by one. In addition, the hilighting mode will be able to operate on the multi-selection. The multi-object selection will be also used by the cut tool in order to cut (optionnaly) only the selected objects. We have just finished the translation of the Website in French, and add the localization capability to our Website compiler HTGen. The French localized Website is http://www.clari3d.com/fr. Our bag is not empty: Clari3D Free for Windows, Mac and Linux are available for download, and Clari3D Light and Preview are available for purchase! Yes, our Website and the new generation of software are now in place! This was a big effort that worth the investment because, now, everything can evolve more easily than ever. Please be patient if you encounter some difficulties: our support form is here to help you at http://www.clari3d.com#support. Great day! Clari3D Free, Light and Preview 2.0.0 are just validated by Apple engineers and are available in the Apple Store as a free upgrade for existing customers! The new Website is now finished and is moved to the beta state. Deep reading and English corrections are in progress (If you find a spelling error, feel free to inform us, we will appreciate your help!). We need to validate the PayPal® payment method and switch to true PayPal instead of Sandbox PayPal. 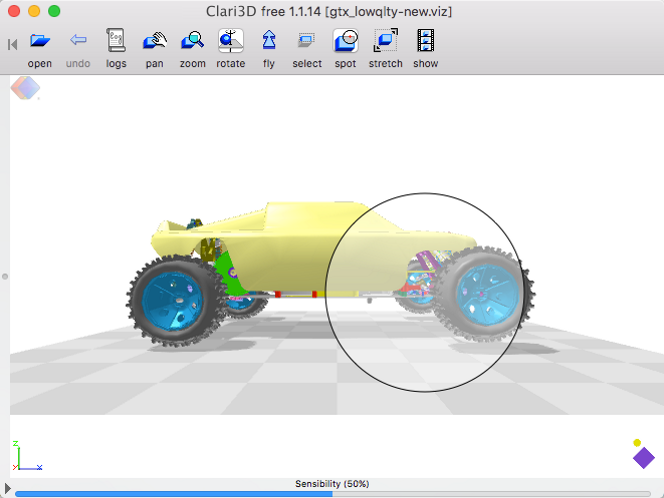 Clari3D Free are built for Windows, Mac and Linux. Installation packages should be uploaded soon. 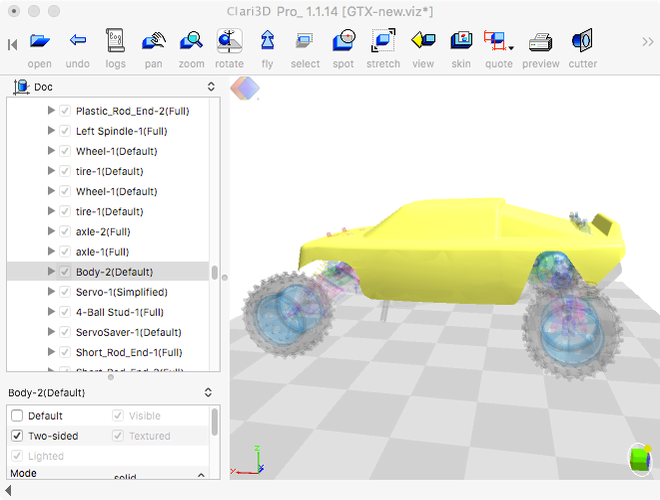 Clari3D Pro has two features to finish before publication. We would like to thank a lot the early users who have registered their account! Thank so much you for your interest. Your work will not be lost: your account will not be deleted and you will be notified when the software is available. We have designed for this purpose a Website compiler that generates static Web pages. In addition, we have renamed 'caniviz' as 'clari3d', with the new logo. 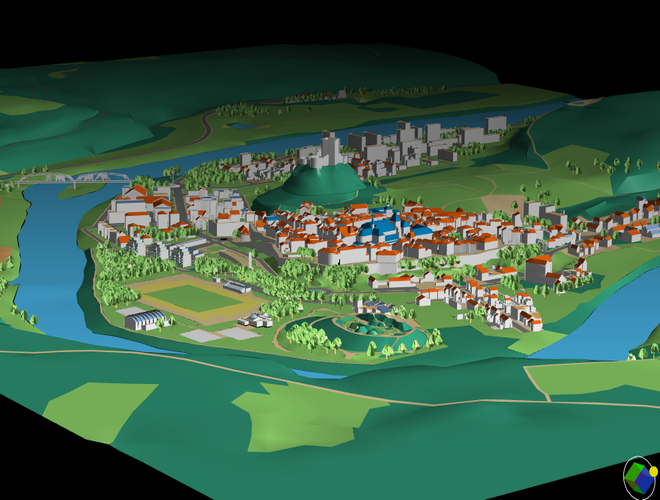 We are finishing our WebGL CaniVIZ viewer integration: caniviz.js is a tremendous 3D viewer for the Web browsers. From CaniVIZ Free, Light and Pro, everyone will able to save a file in either J3D (our custom 3D format for the Web) or directly in HTML with the J3D file embedded inside and put in the Web (The caniviz.js functionalities however will depend on the used CaniVIZ generator). In the future, the files sent will be optionally 'managed' ; this means that they will be stored in our server, and any receiver will be able to annotate it; the annotations will be dynamically shared between all the receivers. The Windows version of the CaniVIZ suite has been update in out Store in order to correct a potential software activation problem that can occur in some systems, avoiding activation. CaniVIZ Pro 1.1.3 ans CaniVIZ Light now have true volume shadows for nice 3D rendering. 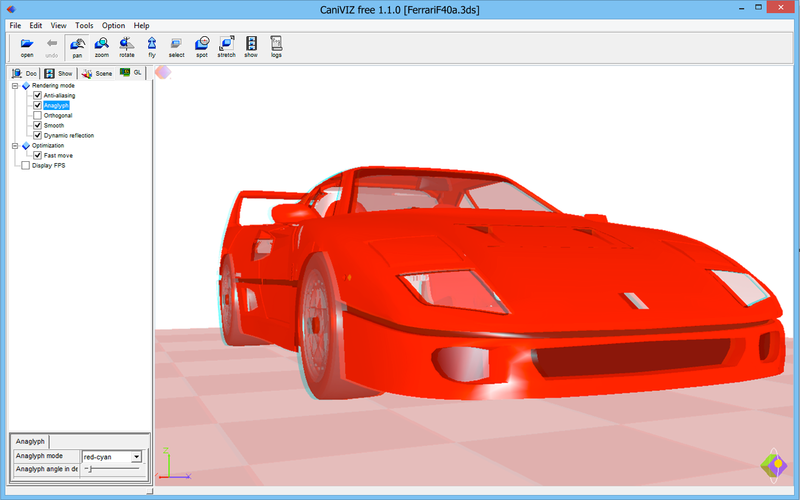 CaniVIZ Free now has protected shadows onto the 3D base. The AutoCAD DXF/DWG reader is now free of charge. It can be "purchased" at a 0 cost from our store and Ubuntu Store, and it is a free of charge InApp purchase in the Apple App Store. We are proud to announce that CaniVIZ 3D Viewer 1.1.12 is released and pushed in the Apple Store, the Linux Ubuntu Store and the CaniVIZ Store. This release is available free of charges for our customers, as usual. It fixes some minor features for all the OS and a big issue for Mac, in the user interface. 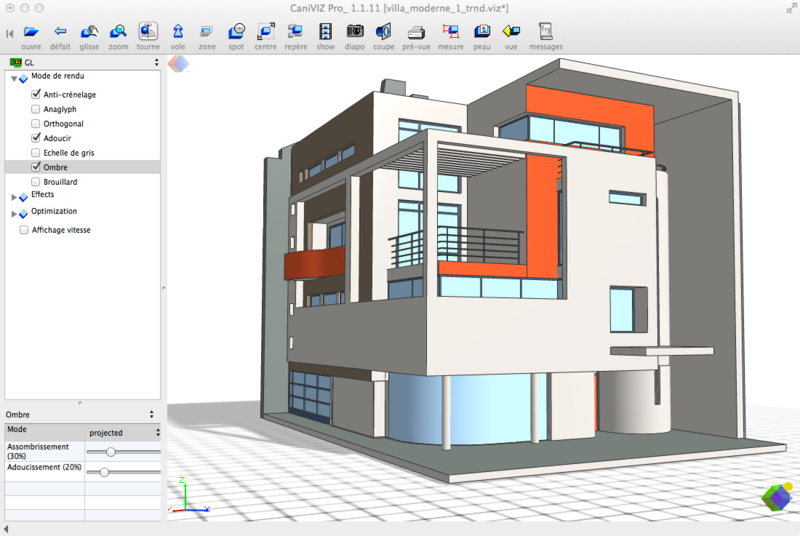 The last update of CaniVIZ 3D Preview 1.1.13 now works with Trimble Sketchup files, as a bug is now fixed! This is nice to have a preview in Finder. It just has been approved by Apple App Store reviewers. Notice that the Windows version does not have this bug and works well to with Trimble Sketchup files. We are proud to announce the new Website at mydocs.me where you can create and use your 3D workshop in the cloud. These workshops allow, for free, to store, share and display files, even 3D files. The 3D files can be converted in our 3D VIZ ultra-compact format online, for free too. Texts, images, sounds, PDFs and 3D files can be viewer online. All the files are versioned. We are very happy to announce that we have made CaniVIZ 3D Free available for free in order to let more users use this exiting software. It is available at the Apple Store, the Linux Ubuntu Store and the CaniVIZ Store. A new version of CaniVIZ 3D Preview is submitted to the Apple Store today. the small logo on the top-left corner is now smaller and lighter. 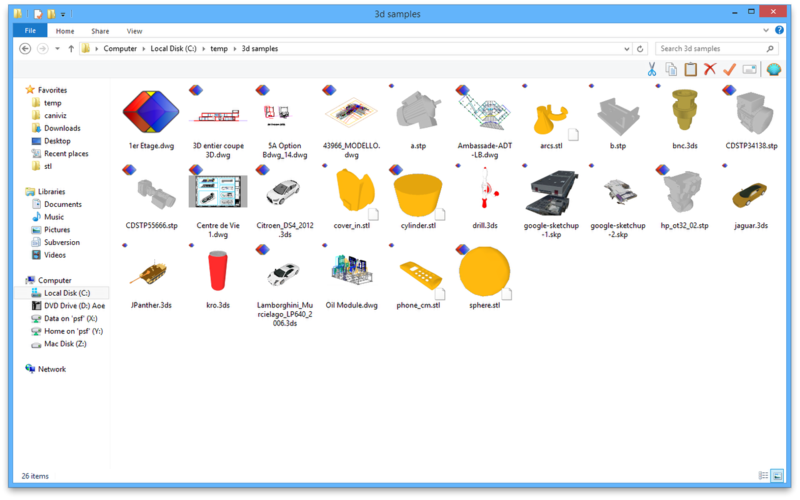 CaniVIZ 3D Preview is a tool that replaces the 3D file icons by a thumbnail of their contents. 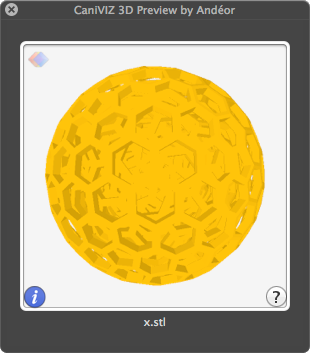 What is nice with CaniVIZ Preview is that it allows to generate a preview for file formats that does not have a preview image inside, such as STL that is pure ASCII file. 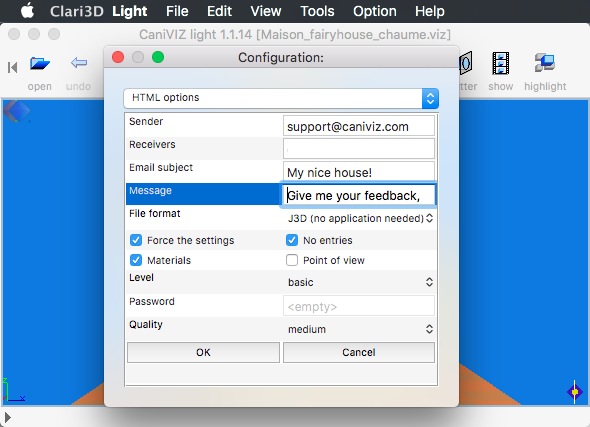 CaniVIZ 3D Preview comes with a plug-in that is used by the system to generate the preview in the Finder or in other places where preview are allowed, and with an application that allows drag and drop. 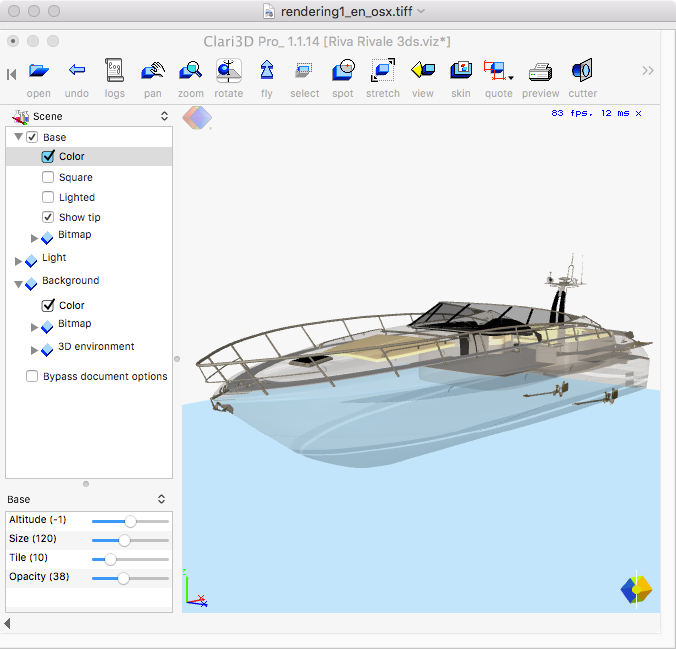 CaniVIZ 3D preview handle the following formats: 3D Studio, STL, WaveFront, ASCII point cloud, Step / IGES, AutoCad® DWG™, Trimble Sketchup® or Dassault System 3DXml®, CATPart® and CATProducts®. Notice that the rendered files are rendered without the textures due to the Apple QuickLook technology that is protected by a sandbox, and some wide files cannot be rendered due to time and resources limitations. CaniVIZ 1.1.10 for Windows, Mac and Linux is released and available in the Apple Store, Ubuntu Store, and CaniVIZ Store as well as CaniVIZ 3D Preview for Windows and Mac. CaniVIZ Free, Light and Pro 1.1.7 are now in the Apple Store, Linux Ubuntu Store and CaniVIZ Store as a free update. 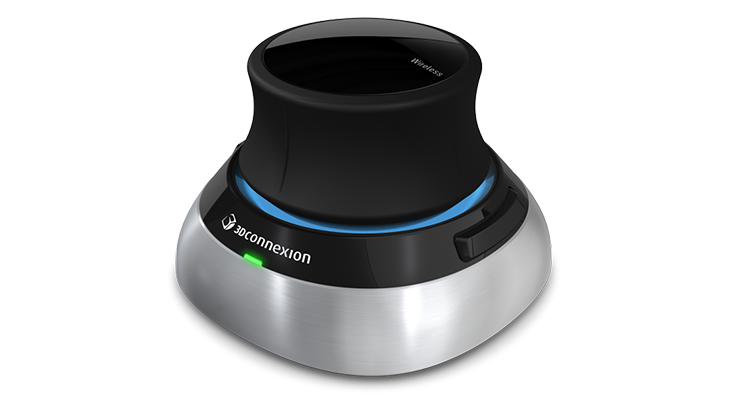 They now support 3D SpaceMouses from 3DConnexion® to ease scene manipulations. The Linux version has also been updated to correct an OpenGL error in 64 bits systems. Dassault System Spatial Interop is our CAD file format readers (Step, IGES, CATIA, Pro/E, etc). They have chosen to change their licence in a way that is clearly unfriendly for start-ups and small business companies. This group only focus on money and profit without any consideration for investment in the future. This is very inglorious for this French company. But finally, this good news for our customers because we now have a second source CAD reader that is much more efficient (models are smaller and more beautiful), much more small (the binary libraries are about 30MB while Spatial Interop was +250MB!) and with a much more affordable price... In addition, the readers will be available for Windows, Mac and Linux! We are working very hard to make available the new CAD readers. 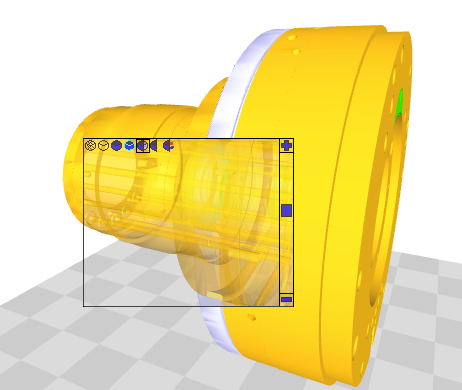 CaniVIZ Pro 1.1.5 now includes a Step and IGES reader for free. CaniVIZ 3D solutions have obtained the Microsoft's Windows 8 platform ready certification. CaniVIZ Free & Light 1.1.4 for Linux are available on our Website and at the Linux Ubuntu Store free of charge for the customers. They are compatible with the last official Ubuntu Linux 12.10 and previous. In our Store, the Debian, Redhat and Slackware packages will be available. If you have subscribed to any Clari3d newsletter you may unsubscribe at any time by following the instructions located within each newsletter and on our Website, or by contacting us. We may also use or disclose personal information or Customer Data if required to do so by law or in the good-faith belief that such action is necessary (a) to conform to applicable law or comply with legal process served on us or the Website; (b) to protect and defend our rights or property, the Website or our users, or © under emergency circumstances to protect the personal safety of us, our affiliates, agents, the users of the Website, or the public. In cases where we must disclose personal information or Customer Data, we will send email to the address registered to any accounts affected by that disclosure. If you purchase a software or service in our Website, we do not have any knowledges of your credit card or even the paymennt method you used as the purchase process is entirely managed by Paypal, Inc. We only recieve payment notification. We keep a copy of the invoices for ever for legal reason. We maintain backups of Customer Data in order to recover from hardware failures or other problems. These backups are not kept longer than two years. While we use reasonable security measures to safeguard your personal information and Customer Data once we receive it, no transmission of data over the Internet or any other public network can be guaranteed to be 100% secure. You should know that no company, including Andéor, can fully eliminate security risks associated with personal information or Customer Data. Accordingly, Andeor cannot ensure or warrant the security of any information you transmit to us on our Sites. To use some features of this Website, or our software, you may be asked to set up an account and provide a functional email address and password. You should be careful about providing your password to others - you are responsible for the actions of anyone you've shared your password with. No one at Andéor will ask for your password; if they do, you should not provide the information and should email infos@clari3d.com to report the incident so we can investigate. If you have previously opted to subscribe a Clari3D mailing list, you may always opt-out of receiving future e-mail messages and newsletters by ending your subscription. Unsubscribe instructions are located within each newsletter and on our Website, or you may contact our Customer Service Department. We will help you to correct or update personal information that you have previously provided to us. To do so, you can access, correct and update certain personal information that you have provided to us by emailing support@clari3d.com. If you wish to cancel your password, please contact our Customer Service Department by email at supportclari3d.com. Questions regarding this statement should be directed to info@clari3d.com. This Website is generated by HTgen, a Website compiler designed by Andéor.